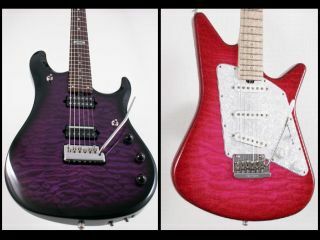 Ernie Ball Music Man has announced a pair of high-end signature electric guitars as part of its Ball Family Reserve range. The Albert Lee BFR takes the existing Music Man Albert Lee signature model as a blueprint. Weighing in at just 6 lbs 11 oz, the six-string features a southern ash body with a book-matched maple top, a mahogany ‘tone block´ and a maple neck. Available in Lee´s favourite Pink Burst finish, the model retails at £2495 in the UK. Check out this MusicRadar video lesson with Albert Lee. The John Petrucci Baritone BFR mirrors much of the spec of the Dream Theater guitarist´s Music Man signature electric, but is the first Music Man to feature a 27.5-inch scale length. Retailing at $4199 stateside, the Petrucci Baritone is equipped with DiMarzio pickups, an alder body with a book-matched maple top and a mahogany ‘tone block´. In addition, selected Ball Family Reserve instruments are now available in tobacco, amethyst and emerald burst finishes. For more information, visit the official Ernie Ball website.